and according to Terry Kizer, owner of Mr. Turbo, thats to add a turbocharger system to it! If you do not know about the legacy of Mr. Turbo, his racing past includes the first official seven second gas pass, the quickest Funnybike pass in history which held for over six years, 6.88-seconds, and countless wins and championships. He also holds bragging rights on the street by having the worlds most powerful streetbike (494 horsepower at the MMI Horsepower Shootout), and ran 230 MPH during the Cycle World Extreme Sportbike Shootout. When it comes to top speed, Mr. Turbo has the experience! and we always want to go quicker and faster - no matter what the level we are at. because you can build more horsepower, easier, and more cost effectively. Want to take the engine building route? By the time you a set of pistons, a couple of camshafts, some valves, and then pay somebody to port the head, machine it all together, and then do assembly and dyno tuning, you will easily spend between $5,000 to $10,000. When you are done, you will be hard pressed to make over 220 horsepower from a "full race" build up, and you will hardly have a streetable bike when you are done! just how much power can you make with this turbo system? According to Kizer the general rule is 10-12 horsepower for 1 PSI of turbo boost. In simple terms, if you run 5 PSI, you will have over 200 horsepower at your command, and at 12-15 PSI, you will be at 300  which is more then even the most advanced street rider will need! the rate of acceleration will be unlike anybody in your circle of friends has ever seen before! Two things control horsepower; how much throttle you give it and how much total boost has been dialed into the system. An adjustment screw on the wastegate allows final boost settings to be pre-determined. If you run the 8-10 pounds of boost (or less), your engine should suffer no engine damage over the long term. Using a turbo system with electronic fuel injection means that the proper air/fuel ration is maintained, and high-pressure fuel injectors pump gas quickly into the intake ports on demand. As the result, the old days of turbo lag and waiting for the turbo to "spool up" are gone! When you receive your system it comes in a large box, and while unpacking it you can become intimidated by all of the parts. Luckily, Mr. Turbo includes a comprehensive installation booklet, which provides quick part identification and guides you through step by step installation. It really is as simple as reading and following instructions. The average person, with an average selection of hand tools, finishes the install in an afternoon! As with all of Mr. Turbos systems, the kit comes complete with all parts required for installation. Were talking about every last electrical connector, zip tie, gasket, hose, bracket, clamp, spacer and fitting. The only extra component you will need to buy, in this case, is a Power Commander II module (available from Dynojet), which is used to recalibrate the stock fuel injection. They have even gone as far as providing the system with an aluminum-ceramic coating on the header and duct pipes, and they have polished and chrome plated the turbo exhaust housing, the workmanship is phenomenal!. The installation process begins by removing the fairing lowers, and tilting up the gas tank. Afterwards, you begin dismantling the stock exhaust system from the bike. Its hard to reach the stock header bolts, so you must remove radiator-mounting bolts and slide it forward for access. If you have a fresh supply of anti-freeze, pull it completely off and the process will be even easier! The stock oil cooler is also history, and will be replaced with a unit supplied with the kit. So remove it, and its feed lines, off of the bike and place it in storage. because you probably save about five pounds of total bike weight by adding the turbo system! The stock exhaust is one heavy unit! 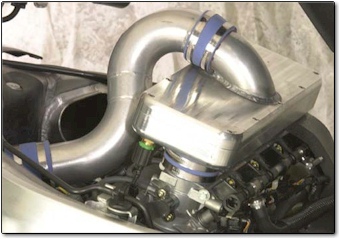 Mr. Turbos system is built around a Rajay F40 turbocharger, which has been the industry standard for many years. It is durable and is capable of producing 25+ pounds of boost without failure for a very long time. Yes, there are more fancy (and more costly) units on the market, but Kizer sites the old reliable is still the best  and I tend to agree after testing many of those over the years. The turbo mounts in front of the engine  in the location that the oil cooler once called home. It is connected to a custom header, with an incorporated and fully adjustable wastegate (a regulator that will govern the pressure output of the turbo). 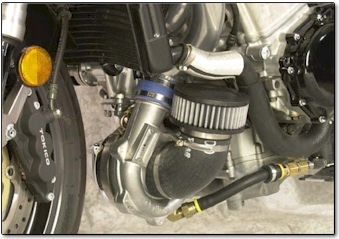 Exhaust gasses are directed from the turbo through an exhaust pipe, that takes the stock path down the right side of the bike to reach a stock-appearing polished aluminum muffler in the stock location. More then another great looking muffler on the market, Mr. Turbo has actually designed this part to be perfectly matched with the turbo system  offering higher flow and less restriction. Since the turbo naturally quiets down the engine, a quiet muffler is not required. On the opposite side of the turbo, pressurized intake air is sent through a ducting pipe, which runs up the left side of the radiator and hooks a turn into the engine compartment through the stock ram air hole in the frame. A connector hose mates it to the billet aluminum intake manifold, which replaces the stock airbox. Thats the major part of the installation, and only a few minor steps remain. A new high efficiency, more compact design, oil cooler is mounted to the radiator and pre-made reinforced hoses connect it to the engine. An additional oil line runs from the engine to provide lubrication for the turbo, and an electric pump scavenges the oil back into the engine. Not knowing the limitations of the stock fuel system, Kizer flow tested the stock fuel system and found that the stock fuel pump was only good for the low/mid 200 horsepower range. Knowing that that mark would easily be passed, he provides a high flow pump and regulator which can answer the call when you need the extra power. After finalizing a few wiring connections, making sure all of the nuts, bolts and fittings are tight, running over the hose clamps on the intake ducting, and running your hand down the oil lines to make sure there is no leaks, you are ready to fire it up! Do your initial fire-up with the bodywork off, because theres always that one bolt or fitting that you forgot to tighten (such as our forgetting to check all of the header bolts!) and its easier to check (fix) this way. While doing testing on this bike up at Dynojet's Las Vegas facility, we got to try out some of their new products which have raised the bar for dyno testing motorcycles! Their new air fuel ratio monitor allows real time monitoring of air/fuel ratios while running the bike right on the monitor with the dyno software. It's instant, and while tuning the Power Commander II, you can see in real time what the difference is with each minute change! What use to take many hours, can now be accomplished in minutes! Their new load control allows the engine to be held precisely at a specific engine speed so you can tune the bike in simulated conditions and at all different throttle positions. These two units combined made tuning the Power Commander II an effortless task. 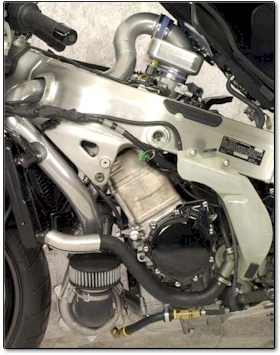 The bike was completely mapped in a fraction of the time it would have taken without these two devices, and they are something you should look into if you already have a dyno in your shop! Mr. Turbo has done really their homework with this system, and their customers reap the reward. Suzuki never thought people would do things like this to their motorcycles, so they did not design the fuel injection to work in this fashion. Mr. 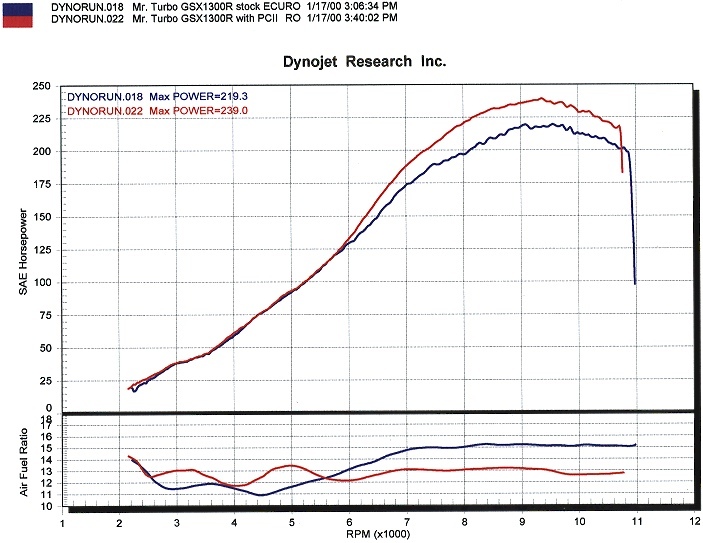 Turbo teamed up with Dynojet Research to figure out the best way to handle the tuning and they responded with one of their products called the Power Commander II. Its an electronic control unit, which goes inline with the stock EFI computer. It allows the EFI to be re-calibrated and provides total control over the fuel and ignition curves. Dynojet engineer Michael Belcher spent several hours on the dyno developing a perfect fuel map which would provide a driving experience that is better then, or equal to, stock in all conditions. When you roll on the gas, theres no stumble, no hesitation, just full on fun! 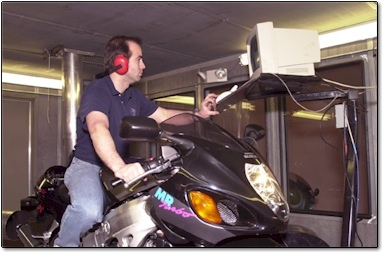 Since many Hayabusa owners already have purchased a Power Commander II to recalibrate their bike for an aftermarket exhaust, Mr. Turbo decided it was best not to incorporate one into their kits. Should you not have one, rest easy because they are readily available at any Dynojet distributor for about $300. With your turbo system, Mr. Turbo will provide a copy of their special fuel map, and you will instantly have the tune-up that Dynojet developed! and you do not have to be a computer guru to do it! First, before you throw your leg over a Turbo Busa, do it with your eyes open, brain engaged, and wide open highway in front of you. because its going to accelerate much quicker then you are use to. Use 5 PSI first, and take it slow! there is no way I can begin to describe it. 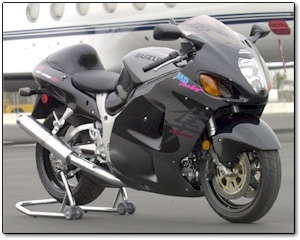 This system will make your Hayabusa will go much faster then you (or your speedometer) will want to go. it will produce boost. It is most effective at engine speeds above 3,500 RPM, however I have seen boost at 2,000 RPM! it made about 11 horsepower per 1 PSI of boost; we saw 242 horsepower easily with 6-7 pounds of boost. but I have no reason to believe the system cant produce over 300 horsepower easily, and thats more power then any of us can even think about running on the street. that it simply is too much power to play with on the street! As anything in this world, Mr. Turbo offers this kit with a few options. The baseline cost for the system is $3995.00. If you do not have a Power Commander II, it will run you about $300 extra. 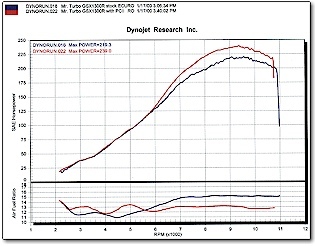 A dyno sheet from a 7 PSI run, note the 239 horsepower maximum! The 219 horsepower figure is without a Power Commander II installed - using the same boost setting. If you want to get really serious and do some racing, a multi-stage boost controller will help with traction by allowing two levels of boost  selectable by the flip of a switch. For all out race applications, Mr. Turbo has their own replacement EFI computer, that when coupled with an aftermarket ignition system and higher flow EFI nozzles, will allow you to make power 500+ horsepower (engine modifications are required for strength!). you are going to be half the way there! To report your news or tell us about a new product... email news@dragbike.com! Copyright © 2000 DRAGBIKE.COM, all rights reserved! By accessing and/or using this site you evidence your approval and acceptance of the following terms: All materials contained in this site are the copyrighted property of DRAGBIKE.COM. To reproduce, republish, upload, post, transmit, modify, distribute or publicly perform or display material from this site, you must first obtain written permission from the DRAGBIKE.COM.